Greenerd, Nashua, NH, will showcase its extensive hydraulic press capabilities, and have application experts available to discuss specific user applications and press requirements. With capacity to 40,000 tons and bed sizes exceeding 240 in., Greenerd presses are available in a variety of styles including gap-frame and straightside. Stop by the booth to learn about its recently completed 200-ton, eight-point gib-guided press for a North American automotive customer adding capacity in Mexico. The press also includes an under-bed mounted eject, and an HMI that features multiple-position stroke profiling and hydraulic-flow and pressure control for cam cylinders in the tooling. 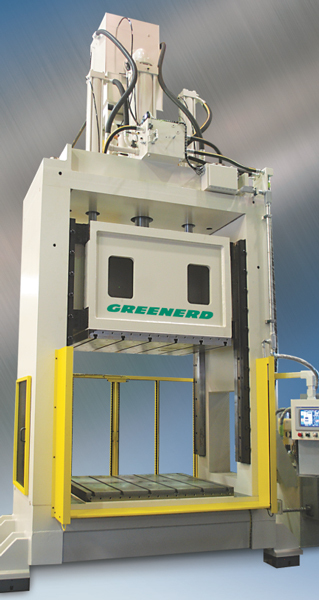 At press time, Greenerd also is building a similar 500-ton gib-guided press.